Car owners seldom think about the parts of the vehicle they can’t see. This is why they hardly ever wash the car’s undercarriage. People tend to have an ‘out of sight out of mind’ mentality. This can actually prove to be damaging for your car. Neglecting to wash under the vehicle can cause premature wear. The undercarriage is the area most susceptible to dirt and grime buildup. This is especially the case if you use your vehicle for off-roading, or if you drive on heavily salted roads during winter. The undercarriage has drainage holes. Debris accumulation can clog these holes so they don’t drain as they should. The undercarriage is also prone to rust. The metal parts are bare and do not have the paint and wax as a buffer to protect the surface. Rust causes premature breakdown of undercarriage components, such as the axles, muffler, control arm, and drive shaft. This can drastically lower the car’s value should you ever decide to sell the vehicle. We understand that washing under the car is inconvenient and a hassle. You can always bring your vehicle to a car wash for the job. 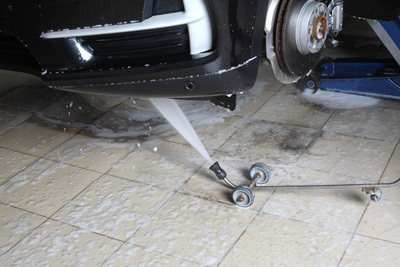 Cleaning the undercarriage requires a foaming or degreaser cleaner and high-pressurized water. A washer lance or hosepipe attachment is really useful here. Otherwise, you would have to get on your back to reach the car’s underside. You don’t need to wash the undercarriage every time you wash the vehicle. Washing it every other car wash will suffice. Bring your car to Bellingham Detail and Auto Glass for a scheduled wash. See our car care package for various auto detailing plans. Due to the nitty gritty nature of washing a car’s undercarriage, we suggest leaving this part to the pros.